Scooper - Technology News: The world is changing – can the US maintain its competitive edge? The world is changing – can the US maintain its competitive edge? At the World Economic Forum, we’ve been measuring nations’ competitiveness for nearly four decades because we believe it is the best way to assess countries’ future productivity. Productivity, of course, is important as we believe it is the best way to boost income – after all you can only earn more if you work harder or smarter – and this, at the end of the day plays a large (but not exclusive by any means) factor in determining wellbeing. All of which is fine, but economics is never frozen in time and dynamics that were shaping nations’ competitiveness in the 1970s may barely register in 2016. The current methodology of the Global Competitiveness Index has been in use since 2006, and while we believe it is still the best measurement around, we have to acknowledge that the onset of the Fourth Industrial Revolution is changing again the nature of competitiveness. For example, we are seeing innovation play a much more prominent role in the development of emerging as well as rich countries. The advent of robotics, for example, means countries at an earlier stage of development will be less likely to be able to leverage low wages to capture manufacturing jobs. At the same time, countries like Rwanda, that are investing in quantum computing and extensive 4G mobile networks, stand a good chance of overtaking economies that have been slower to embrace knowledge-based industries. This doesn’t mean countries can forget about doing the basics well: sustainable development will always need good quality infrastructure, education, institutions and functioning markets. But it means that countries that are emerging need to pay attention to more complex areas of competitiveness, such as innovation, and whether their businesses are sophisticated enough to compete against global competitors. Our Global Competitiveness Index will change to reflect this. As more and more data becomes available, we have the opportunity to take into account the changing dynamics of global competitiveness. Innovation, for example, has always been an ecosystem rather than a linear exchange between academia and society, so there is a need to demonstrate this by capturing the relationship between innovation, creativity and entrepreneurship. Training and education, too, are vital enablers of future prosperity but it’s not just a matter of enrolment or even the quality of science and math education; economies are built on out-of-the-box thinking and creative thinking and this needs to be measured too. On the occasion of the opening of our new Center for the Fourth Industrial Revolution in San Francisco , it seems a timely opportunity to take a look at how the United States might fare in some of the new indicators that we are developing for the Index. According to our most recent look at global competitiveness, which we released last month , the US is already in a strong position as it has been able to leverage its status as the world’s innovation powerhouse, which has carried it to third position in our global rankings, behind only Switzerland and Singapore. Can it retain this strong global ranking in our new competitiveness environment? 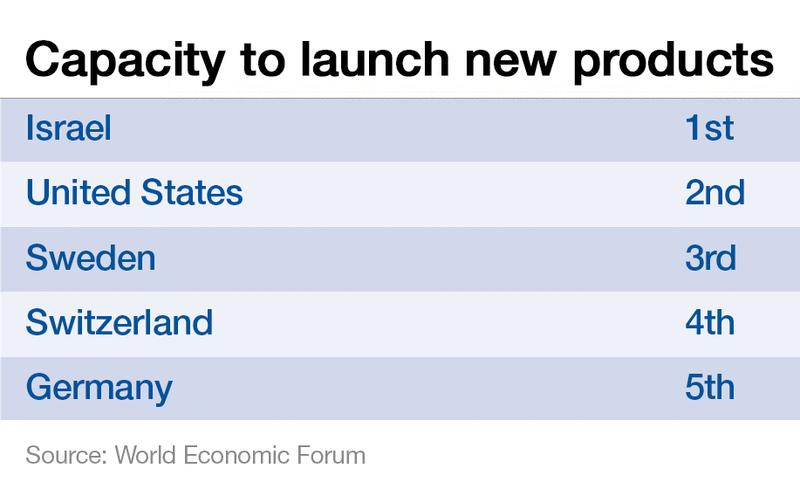 Unsurprisingly, the US economy fares strongly in a number of areas related to innovation. Its capacity to launch new products, for example, is second only to Israel, while it also ranks in the top five worldwide when it comes to collaboration between and within companies, encouragement of ideas generation, ability to embrace disruptive ideas and build international brands. Still within the innovation ecosystem, the US comes second in two important measurements within our Business Dynamism pillar; ability to grow innovative companies and attitudes towards entrepreneurial failure. And its innovative potential is helped by well-developed financial markets, where it ranks 2nd for venture capital availability and 7th for financing options for SMEs. But there is always room for improvement. In our current methodology, the US comes 8th in our higher education and training pillar, however in some of the new indicators we are working on it does less well, coming 14th in terms of its ability to apply critical thinking in teaching (the leading country here is Denmark, although interestingly Japan, another top 10 country in this year’s Index, ranks 128th worldwide) and 17th for the skillset of its university graduates. In health, too, where we essentially measure three outcomes; disability-adjusted life years; infant mortality and absence due to poor health, the country ranks around 50th place. The US may be able to look forward to the Fourth Industrial Revolution with confidence but innovative strength will not be enough to secure competitiveness on its own: improvements in health, education and training outside its well-established centres of excellence, as well as a renewed focus on traditional shortcomings such as institutional strength and infrastructure will be required to prepare America for the changes the world is about to bear witness to. As Barack Obama himself writes in Wired this week, the country is well-equipped to take on the challenges it faces. “Sciencing the heck” out of problems, he points out, has brought about notable successes: imagine what the future holds if this innovative spirit can be applied to tackling all of the challenges America, and the world, faces.